Looks great, you might want to keep the suet hidden in the holes so it doesn't show in your shots. Post some of your bird shots here so we can see what it's attracting. I just buy a big bag of good mixed bird feed from WalMart and hand broadcast it into our rural back yard ( no lawn or flower beds) & deck. Those are 2X6's on the deck to give you a comparison of the size of these largest of variety of Pigeon - and they are wild and still hunted in CA. Clever. I have a natural bird feeder in my front yard. It's called a tree, and it keeps attracting large woodpeckers. There was one there a few days ago. Usually, they arrive when the weather is warmer. Most of the holes they have made over the years have completely healed and closed up. 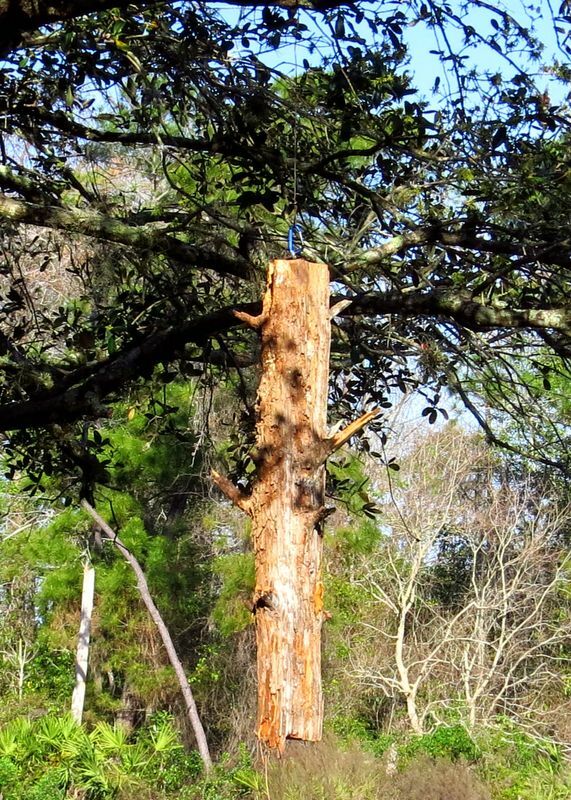 Jerry, I think the tree thing could catch on, birds seem to like um alot...... No joke I have a couple of large oaks in my backyard that I spread peanut butter on the trunks and it really draws in the woodpeckers. They love peanut butter. 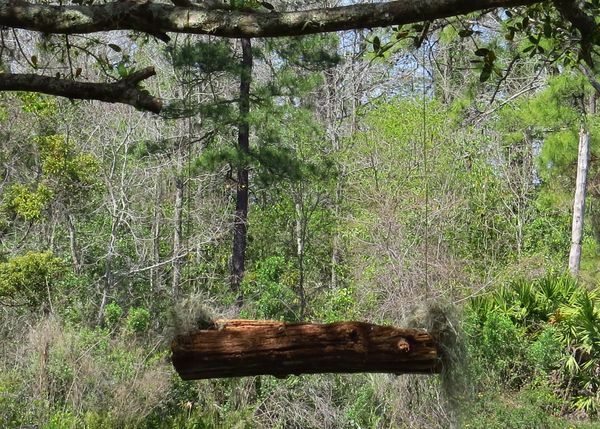 This is a wonderful idea but I wouldn't be able to do this nor would my husband,do you know who sells feeders like this.I have purchased a small wood log with holes drilled into it so I can fill it with suet from Wild Birds Unlimited but I have seen any type of logs this large! No, hummingbirds drink nectar, so they take a different "feeder". But if you cut off the perch ring on hummingbird feeders, so they can't sit and sip, you'll create photo opps for yourself. Watch them and they'll get in a rhythm, sipping from the feeder, backing away while they swallow, then coming in and sipping again. Will this work for hummingbirds? It could if you put tubes of nectar in the holes instead of suet. Most of us who like to shoot birds put feeders in our backyards to attract them. The only problem is that your great bird shot is not that great because a plastic commercial feeder is in the picture. Here is a great way to get around that. Go in the woods and cut yourself 2 logs about 8" in diameter and 3 feet long. A rotted log on the ground works best and if it has lots of branch stubs on it all the better. Take one log and drill about eight 1 1/4" holes about 1" deep on opposing sides. 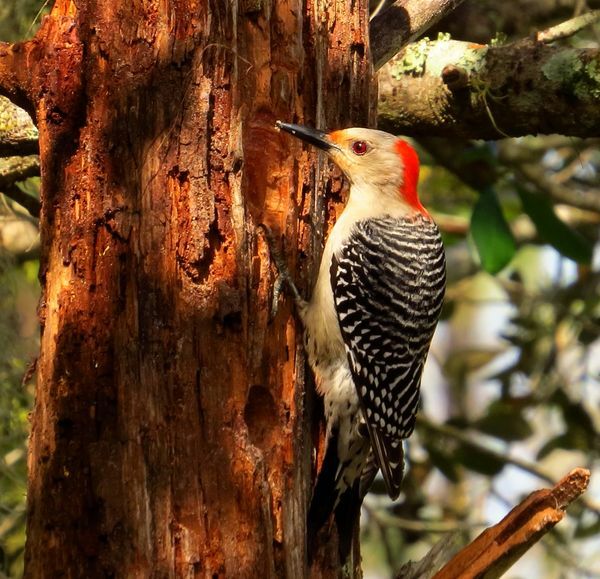 Pack the holes with your choice of suet, put a heavy duty eyelet in the top and hang in your favorite tree. Take the other log and cut a trough in it with a hand axe. Put eyelets at either end, fill with your favorite seed and hang. Now your bird shots will look natural and in the wild. You can buy this type of feeder but get ready to shell out at least $90 !!! Wildwood, NJ.... I spent my summer vacation in 1967 running the Himalaya Ride on Hunt's Pier while sharing an apartment with some friends behind the Wildwood Diner. Growing up my family vacationed every year at the Wildwood Villas on the bay and I spent my days at Cape May Beach and my nights on the Wildwood Boards. Great Memories. Lomax, your's looks like a yellow-rumped warbler to me. They have been visiting my feeders all winter. Now, here's one I just can't ID. I feel that I've seen it before but just can't remember what it is. I keep thinking it's a female brown-headed cowbird, but it's too small and the markings are too subtle. This one is sparrow sized; shot about a week ago in deep south Alabama. Anyone? 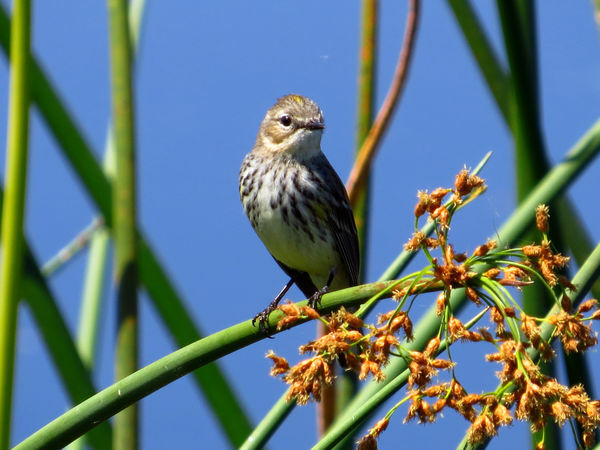 Okay I think I have to go with the Palm Warbler because I saw lots of these birds in the marsh close to the ground. The Yellow-Rumped evidently is a mid canopy feeder. Thanks everyone for you help. Thanks H2, ironic we use the same shortcut signature. I have been signing H2 all my life as my real name is Howard Jr.
Bird Identification may be a useful topic with spring on the way and so many bird shooters out there. My idea is that if you have a photo of a bird you can not identify, you post it here and use the whole community as a resource. I'll be glad to kick it off with a photo of a little guy I shot in the Central Florida wetlands last week 3/11/2014. Anybody know what this is ? about 20 miles north/east of Pittsburgh. We are in a nice small town and the Allegheny river is right across the street. With a nice park. We have a boat and spend most of the summer on the river. Thought this camera would come in handy for the wildlife across the the river where we cant get in close enough for the other cameras. The only thing so far I don't like about the sx50 is the photos seem alittle more grainy at 100%. But I haven't played enough with it yet. Again...many thanks for the site. And THIS site is THE BEST! Everyone is sooo helpful. Don't go past optical zoom in auto..if you go into digital your shots will definitely start to get grainy. Go in camera settings and chose the 2X tele-converter. You will get longer optical and clear. I just got the sx50 and this tutorial site is a Godsend! Im a hands on type of learner and this is just perfect for me! Thanks soooo much for sharing! Best to you, glad I could be of service. Where is that little town you live in. I am from PA originally. My mother was from Ridgeway, PA (upper NW) I was raised near Valley Forge (SE).